Cool. Reminds me of Donald Fagen's song "Tomorrow's Girls". 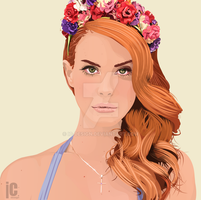 I organize an international competition on the theme of lana del rey, you can translate my site for settlement. Very ver smooth, I like! I love her hair like that. Ghetto fabulous.